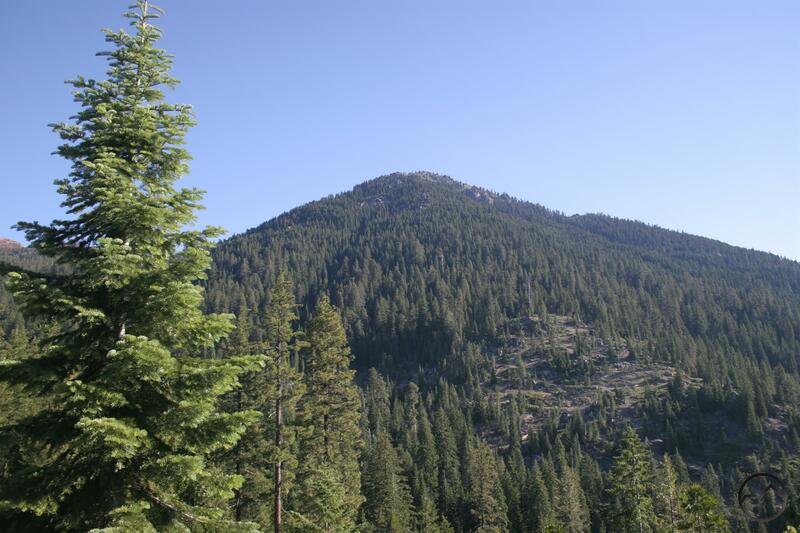 A direct, steep trail through forest cover to the summit of Granite Peak, site of a former lookout tower, where one has great views of much of northwestern California. Red Mountain from the upper Granite Peak Trail. 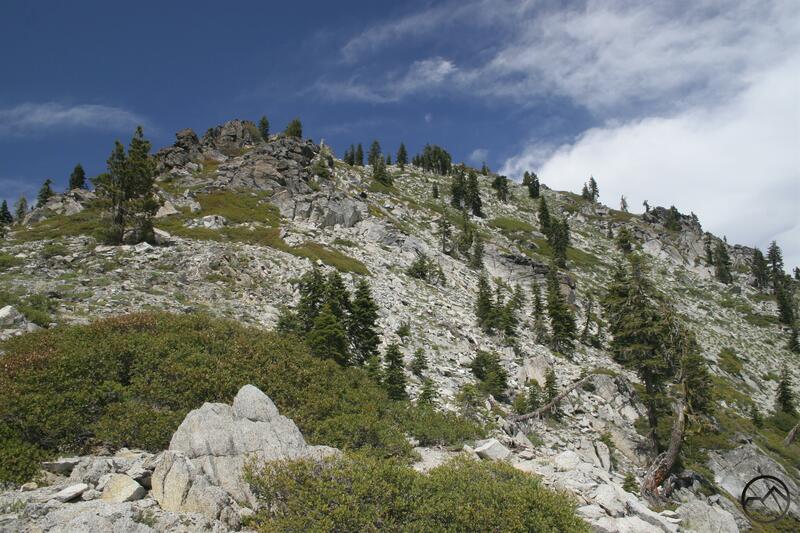 Granite Peak is possibly the most frequently summated peak in the Trinity Alps. This is due primarily to three attributes. First, it offers spectacular views of the Trinity Alps, the Trinity Divide, which includes enormous Mount Eddy and nearby Bonanza King), Mt. Shasta, the Marble Mountains, and as far south as the North Yolla Bolly’s. The second reason the peak sees relatively frequent ascents is its close proximity and easy access from Weaverville, the primary logistical center for the Trinity Alps. Furthermore, the trail is easily reached off of Highway 3, in an area near resorts and marinas, so there is a concentration of activity fairly close to the trailhead. Lastly, Granite Peak is one of the few peaks, indeed the only one exceeding 8,000 ft. that has a maintained trail to its summit. This enables hikers to access the fantastic views without having to resort to off-trail scrambling or climbing. In addition, the Granite Peak trail is one of the few hikes in the Trinity Alps that makes a reasonable day hike, rather than an extending backcountry excursion. As a result, this is one of the most heavily used trails in the Trinity Alps. Of course, heavy use in the Trinity Alps is a relative term. 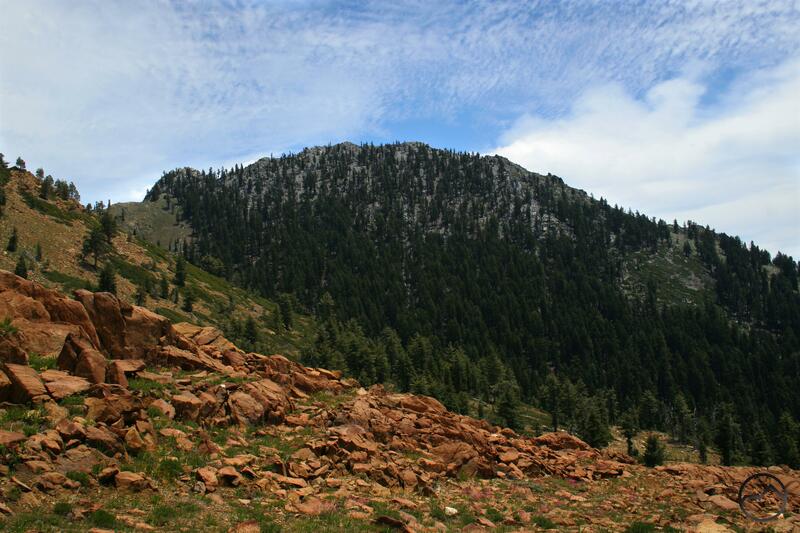 Hikers seeking to summit Granite Peak are likely to have the trail to themselves. If one decides to camp at the summit, it is likely that solitude will be abundant. 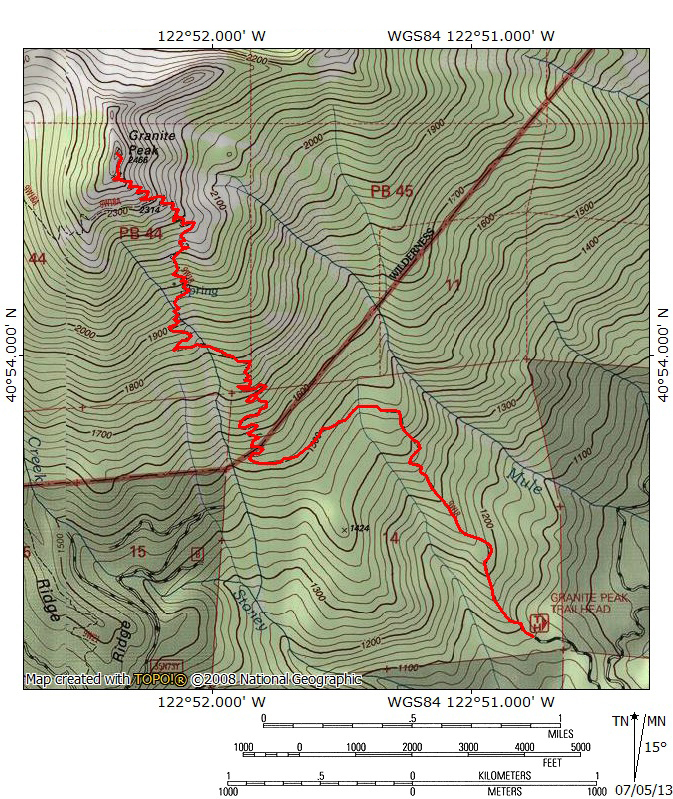 Now, having noted the positive aspects of the Granite Peak Trail, the negatives must be assessed. The most obvious strike against the Granite Peak Trail is the steepness of the trail. It is often ridiculously steep and the grade is unyielding for the entire journey to the summit. Furthermore, there is heavy forest cover throughout and views prior to the summit are few and far between. Unfortunately, the trail is also an inferior route to the summit of Granite Peak. It is the opinion of this author that the best way to make an ascent is to do so via the Stoney Ridge trail. Not only does this route not add significant distance to the trip, it also allows one to include Granite Peak in a trifecta of excellent mountains, which also includes Red Mountain and Middle Peak. This route also starts at higher elevation, thus decreasing the elevation gain of the entire trip. Finally, the Stoney Ridge trail offers excellent trailside camping at Red Mountain Meadows, which allows the trip up to the summit of Granite Peak to be done as a short side trip rather than a day long endeavor. Of course, the views from the meadow are not as spectacular those from a campsite on top of the mountain, but it will be a lot less windy and the views to the south are still spectacular. Looking up toward the summit of Granite Peak. One thing defines the 4.2 miles of the Granite Peak trail: switchbacks. Nearly the entire length of the trail consists of switchbacks. Starting out at around 3,500 ft, the first mile of the route follows an old jeep trail. The forest is thinner in places as a result of logging activity. This section of trail climbs a long ridge that leads up to the summit. An eastern tributary of Stoney Creek lies far below the trail, although the creek is far enough below the route that it is generally inaccessible. There are occasional views of Mt. Shasta when the forest canopy clears enough to allow views to the north. After 1.0 mile, the trail turns to the west and traverses the flank of Granite Peak. This is one of the longest stretches of trail without substantial switchback activity. Shortly after the trail turns west it crosses the upper reaches of the Stoney Creek tributary. This is the first water source on the trail. The view south from the Granite Peak Trail. 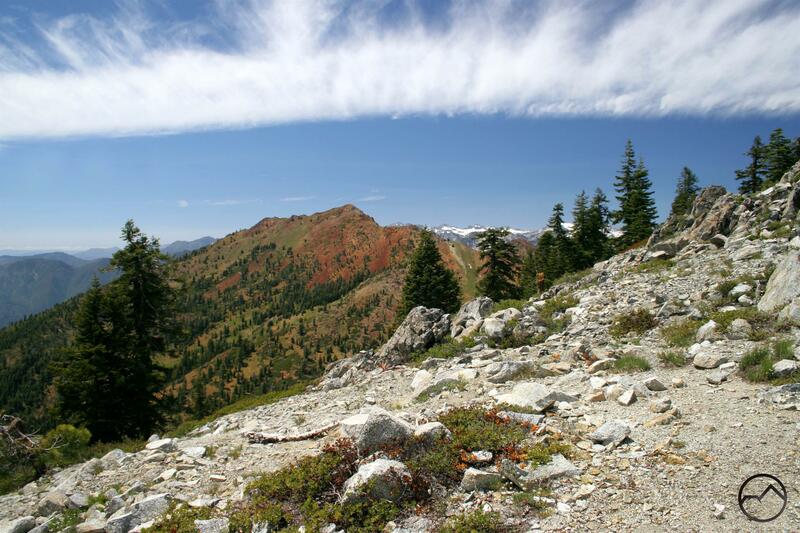 At 1.5 miles the trail crosses the boundary into the Trinity Alps Wilderness. At this point the trail turns sharply to the north and begins to climb steeply in a seemingly unending series of tight switchbacks. After another mile, the route enters into a steep gully drained by the East Fork of Stoney Creek. The switchbacks continue, even becoming more frequent, but the trees thin out a bit, the forest opens up a little and wildflowers and granite boulders begin to add interest to the trail. The pleasantness of the trail increases when the forest gives out in places leaving clear views to the south. The clearings are a dominated by brushy areas, but there are some nice grassy spots that add to the peaceful nature of the area. The summit of Granite Peak. As the trail moves away from the creek (there is no more water for the rest of the trip to the summit), what appears to be the summit comes into view. Unfortunately, it is a false summit. Nonetheless, the views are excellent to the south. The trail continues to switchback upward for another 0.5 miles until it reaches the junction with the Stoney Ridge Connector trail, just below 8,000 ft. The views from the junction exceed those of the false summit, particularly to the west, where Red Mountain begins to take center stage. 0.3 miles of switchbacks climb the last couple hundred feet to the top of Granite Peak. 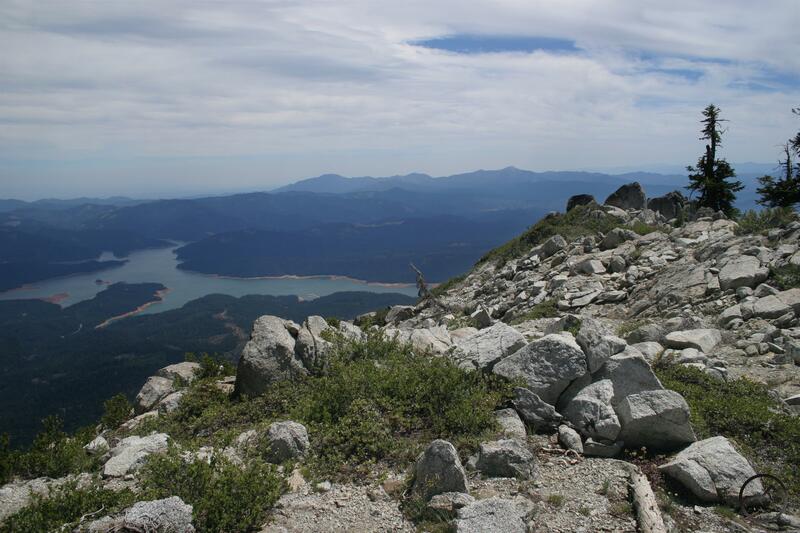 Once on the summit, 360-degree views take in much of the Trinity Alps, the Klamath Mountains and the California Cascades. 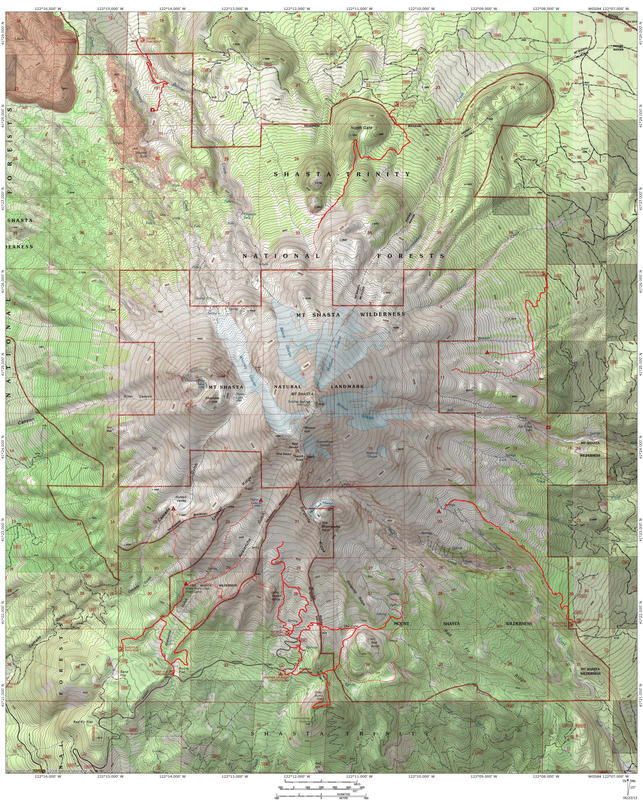 The stratovolcanoes Mt. Shasta and Lassen Peak are visible to the east. In addition to the fantastic views, one can also observe the ruins of an old Forest Service lookout. While no one maintains vigil from the lookout, it is still possible to spend the night on the summit of Granite Peak. A rough trail connects the Granite Peak Trail to a larger network of trails coursing through the southeast corner of the Trinity Alps. Not only does this path increase the possible destinations accessed by the Granite Peak Trail, it also supplies access to Red Mountain Meadow, an excellent camping spot that is not too far from the summit of Granite Peak. In fact, the meadow is home to what is possibly the best view of Granite Peak. It should be noted that it falls into the infamous “scramble” category that is common in the Trinity Alps. The Forest Service designates routes as Scrambles if the trails receive such little use that maintenance is not worthwhile, or if (as is more common) the routes are dangerous enough that the Forest Service does not want to accept culpability for any accidents that may occur. In the case of the Stoney Ridge connector trail, the former reason is the cause for the “scramble” designation. Whatever the reason, the trail is faint in places and some route-finding skills may need to be employed. Granite Peak hems in the east side of Red Mountain Meadow. The connector trail is about 1.0 mile in length. It departs the Stoney Ridge trail just below Red Mountain Meadows (around the 42nd switchback from the wilderness boundary). The junction is signed. The route traverses a gulch drained by spring fed creeks originating in Red Mountain Meadows. The first creek is crossed immediately after leaving the Stoney Ridge trail. The route continues east through a grassy extension of the meadow. The second creek is crossed at the east end of the meadow, shortly before it turns to the south and enters the forest covering the southern flank of Granite Peak. This is the last water to be found on the trip to the summit of Granite Peak. The trail continues south for about 0.3 miles, climbing steadily. Eventually the route enters a clearing with south-facing views. At this point the trail all but disappears and numerous game-routes continue to the east. To regain the trail, climb upwards, through the clearing, gradually heading northeast. Eventually one will intersect the trail. The junction with the Granite Peak trail follows shortly thereafter and the route is well maintained the rest of the way to the summit. From Weaverville drive north on Highway 3 to the signed turnoff for the Stoney Ridge trailhead. The turnoff is shortly after the Stoney Ridge trailhead turnoff. Follow the dirt road 3 miles to the trailhead.